So I am working with this DAC and I am trying to attach reference voltages and outputs, but I am confused. Looking at this image of the board, what is the connection to VOUT ? How do I connect to those 5 gold circles? I think only the center is live. Should I also connect +/- 10 volts to VREFP and VREFN? The data sheet seems to be ambiguous about if I should do that, or if I can attach to +5V to VREF and that will work as well? I also do not know what that port/connector is? 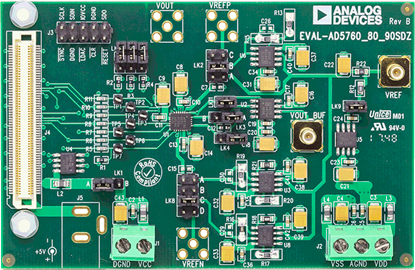 The user guide to the DAC you linked should give you the detail you need. On Page 9, the schematic shows that you can select 0V, -5V, -10V, or an external VREFN (the "5 gold circles" on the bottom in your PCB image). The 0V, -5V, and -10V are all generated on the board. Similarly, VREFP follows. You can get VOUT from the center pin in the "5 gold circles" labelled VOUT. The surrounding 4 are ground. Ideally you would use a proper connector, not just one wire jammed in the hole. Or, you can get the output from VOUT_BUF, which has a connector installed already. See the schematic on Page 9 to understand the difference between VOUT and VOUT_BUF. From Page 16 you can see this is a "Straight PCB mount SMB jack, 50 Ω". You need an SMB cable. You will need to supply DGND, VCC, VSS, AGND, and VDD via the terminals at the bottom of your image. Not the answer you're looking for? Browse other questions tagged connector dac port or ask your own question. What's the use-case for gain selection on a DAC? What is the best connector for this RF 434MHz transmitter module? How do I amplify voltage from a DAC? How to connect STM32 with DAC?